I was sitting a wee while ago in the barbers chair and chatting to Mehmet. 10 years ago he opened Mount Florida Barbers and I’ve been a customer from the week he opened, we’re like occasional friends, I pop in every few weeks, we chat, I get a great haircut. A great example of what a small business excels at, providing jobs and a friendly, reliable and quality service to the local community. We are fortunate in Mount Florida to still have local shops run by small businesses. Butcher, Fishmonger, Grocers, Fruit and Veg, Hairdressers, card shop and Cafes to name a few. 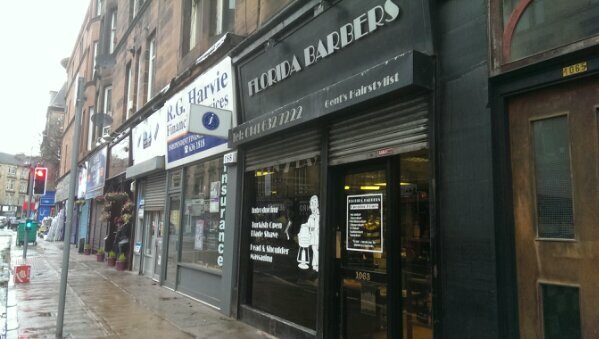 Not every area has been so successful in retaining a vibrant street of local shops. Unlike a many of our neighbours in mainland Europe, we in Scotland have lost many of our small businesses to the monopolistic retail and supermarket chains. The empty retail units on our streets being testament, not to recession but, to the convenience of a big car park, one stop shopping, loyalty cards and ‘bargains’. Running a small business is often hard work and takes dedication and self motivation to keep it going, so have a thought for, and support with your custom the small businesses near you. When they’re gone they’re gone for good, and our communities lose something.